Cities are beginning to compete for tourism dollars based on the branding conveyed by their SSL-lit buildings. Not everyone is delighted by the development. A trade publication for electrical distributors, TED Magazine, has noted this growing competition with approval. As well they might: Members of their readership community stand to benefit directly by more public and private spending on LEDs to illuminate building facades and city skylines. We have discussed how LEDs are transforming cityscapes, including in some very public projects in New York and San Francisco. 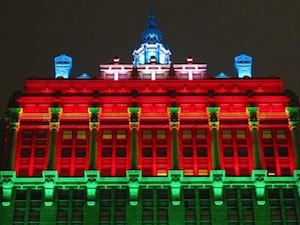 Blogger Bill Reisenauer predicted a competition for the crown of City of LED Lights. Both Perth and Shanghai are now in the game. Now we learn that Chicago and Dubai are tarting up their cityscapes. While the news may delight local electrical contractors, LED luminaire suppliers, and civic boosters, not everyone is cheering. The paradox of SSLs is that for many of the watts saved we find novel ways to pump the power back into the calculations. Electrical lighting was the single greatest influence in the creation and evolution of sign codes and standards for metropolitan governments. Before artificial light, how distracting, offensive, or unfairly competitive could a hanging shingle or engraved entablature be? Chicago Sun Times June 14, 2014 headline: "[Mayor Rahm] Emanuel launches design contest to make Chicago 'city of lights.' " The historic bid document contains passages relevant to this discussion: "The biggest and the brightest does not mean the best" and "The lighting framework plan recognizes the importance of minimizing energy use impact." Let's hope that law and good taste prevail over those wanting to "Trump" the citizenry. In the World's Columbian Exposition of 1893, Chicago was The White City and The City of Lights that introduced the marvel of electrical light to the world. Also at that fair, the War of the Currents was finally settled in favor of Edison's AC. The urban centers of the world are sovereign jurisdictions. For my hometown, Chicago, I hope we do it right. "Bladerunner" is fine for the big screen but not for my Big City. Wachter puts his finger on a wrinkle of increasing efficiency, known as the Jevons Paradox: When a thing becomes cheaper, we find ways to use more of it. We are beginning to see Jevons take hold in the arena of lighting, thanks to the efficiency of SSL, and we are going to see vastly more of the same in the years to come.